Also, thank you for the incredible comments on the previous page, I was really blown away by how thoughtful and perceptive you all are… though I should be used to it by now. I loved reading all your analyses, and could not ask for better readers. Oh yeah and look at this amazing sculpt by Joelle Saveliev that I was gifted this weekend at RCCC, I am still screaming about it. It’s lonely at the top, and the bottom. The bottom is the capital of Saba. And when you were near the top, but suddenly at the bottom. Realizing indecision is a killer when you’re deep underground and ~55 million km from Earth, the latter of which you signed up for. At the top of THAT chimney? Beautiful colors on this page! I read back on the last page’s comments after it was mentioned and was really surprised that a lot of people don’t like Bex??? I’d consider her actions extremely valid up to this point given the situation AND her past, even though the consequences of those actions are just as fair. She’s understandably unpleasant right now but, I wouldn’t be so quick to cast disdain on her or say Michael has been comparatively more pleasant at this point. Both of their introductory treatments of the cave and other characters has been a level of dissociation and selfishness out of fear and denial. I agree, but you know how people are. Mike was introduced to us barely hanging on to life and sanity… Bex was (re)introduced to the current storyline killing a character that was arguably better liked than any other so far. Wait. Levi told Bex the way, but not Mike? Because of his additions or because he is the nicer one of the two right now? Or does this way end at the start? If I’m not mistaken, Levi wasn’t able to communicate with Mike, but Bex can understand them. Well, Mike can’t talk to Threvi, so no. By the time the original robot LEVi was deep enough to know anything about the chamber, he was way out of communication range, and had been considered lost to the base at the start of the comic. As far as we know, Mike has no idea LEVi is still alive; last he saw, his robot was an empty chassis at the bottom of Kalla’s pond. if I remember correctly, Bex’s suit is still pressure-tight and her helmet is intact, so she is equipped to go out onto a surface which (so far as we have seen) is pretty much consistent with contemporary, IRL Martian conditions. The Rover is still, presumably, where she left it and she knows how to drive it, so she can return to the base. Mike’s suit is torn down one leg and his helmet is broken; he may not be able to put it on at all, by now, because of his changes. We haven’t seen anything which suggests that the changes equip anyone down there, to survive on the surface. We have just been told that the cavern has a supply of geothermal energy, steam and gases containing (presumably) oxygen, carbon and sulphides. Levi/Thrip is, as far as we have been shown, a reliable witness who might legitimately know at least one way to the surface, although that knowledge might no longer be valid because of rockfalls altering the topography and/or blocking the route. Bex knows all of the above. I don’t recall how much she knows of Mike’s mental issues, although she certainly knows Mike has been sacked (because he told her, IIRC). However she thought he was sane enough to go on an EVA with him, including driving some distance from the Base and abseiling down a cave. The “processor” may simply be a contact Zone with the geothermal/toxic gas emissions, “dangerous” in a literal sense. I don’t see anything preventing an ending along the lines of “Bex returns to the surface following Levi’s directions, drives back to the base, resigns, takes Mike’s place on the return flight (which we know is available) and returns to a life of academic research into Martian colonisation. She may, or may not, reconcile herself with her family and may, or may not, return to Mars at a later date. Mike remains in the cavern; nothing of him that doth fade, but doth undergo a Sea-change into something rich and strange”. These are good points, but I think we should give up on the idea of walking or climbing out. If the cavern can keep its pressure and temperature stable without an airlock seal, that means it must be one or more miles straight down. I do not believe we have seen Mike’s full journey down. We certainly don’t know how Bex made it, but there must be more to it than a cave in followed by a splash. My best guess, the cavern exists to hold on until conditions on the third planet are habitable, then go colonize it in the name of Kallakore’s people. How does it know the third planet is habitable? Eventually it will evolve life that will fly to the fourth planet and find the cavern, activating it. Then the much more advanced Kalla computers will study the foreign creatures and evaluate the best way to subdue us and re-purpose our planet. If Michael or Bex do get out, it’ll be with help from down below, and they might not like what they see. For example, if the processors can duplicate life then Michael and Bex may well have crawled out of the cavern already. As I recall ‘Michael’ was due shortly for a rocket back to Earth. Or the cavern exists solely to exist due to missing parts. Imagine if you had a machine that would do a variety of tasks under the guidance of a set of rules with a self repair feature. The machine works the tasks in order until the goal is done… but what if goal was somehow damaged or missing from the machine’s code and the self repair feature couldn’t restore the goal as well? Then you got a machine that will keep running tasks until it can’t work anymore. That’s what I figure is going on in this place. Everyone, from the sentient life-forms to the sentient and non sentient machines are screwed up. After Bex finds the processor and it kills her, I wonder what she will come back as? Kill her?? you don’t think there’s other options? maybe it will give her candy? I imagine it as a food processor meets sarlacc pit meets 3D printer. Yes, and on Mars, that is what you use to make candy. Looks like Bex needs someone who is good at climbing! I wonder if there’s anyone down here like that? after reading all the “discourse” on last page, was just wondering: do we know that Bex’s family is alive? I don’t remember. Oooh… ^Yeah you said it. Given that duplicated creatures don’t seem to remember being resurrected, I’m starting to wonder if a lot of time might have passed since the humans entered the cave ecosystem. A lot, as in tens of thousands of years. 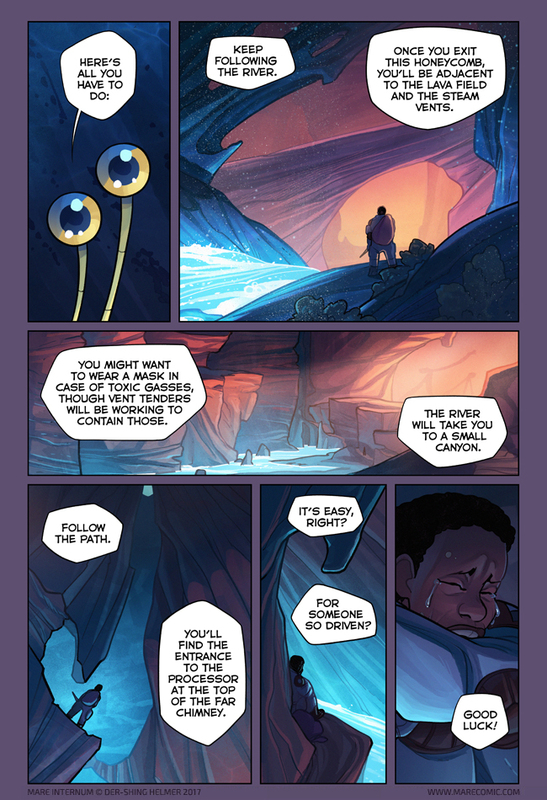 Perhaps Fish and Bex will emerge to find Mars fully terraformed … or that humans are extinct. When Mike and Rebecca left the station, he was just a bit unshaven. But when we last saw him here he has a rather thick beard, although yet not long. Yeah, but we don’t know how exactly the processor would interact with human hair. It might be “resetting” it to the first encounter, when it was a bit unshaven, every time. I *really* like this theory! I hope this turns out to be the case. This page: http://www.marecomic.com/comic/ch1-page-14/ certainly implies that they are. Or that Bex is in such deep denial that Dr. Livingstone spent his career looking for her source. Sure, easy. Hmm, are those spots on her face a sign of the Martian life inside her that allows her to understand Levi? I’d say this is some new type of parasite Bex got while in contact with Martian dirt. Since she successfully communicated with Thrip/LEVi and Martian tech before, these could be unrelated. Since Mike has essentially grown a “toaster” on his face, Bex is is now acquiring a nice “automatic drip coffee maker”. But they seem to be “simple” eyes. I sort of expected compound eyes, as on a bee or trilobite. So – are the lava field and steam vents, the source of the atmosphere, heat and water? See my post above about possible endings..
Man. This comic is so intense. I love your work. I notice Bex is carrying a pointy… Did Kallacore let her keep her elbow…? Kalla probably isn’t overly attached to her elbow. I just realised… why did Bex leave her helmet behind? The battery finally went off in it? Dr. Y. Braid (US) — ??? 1. Is plural for Kallakore’s species “Wollaria”, “Wollariae” or “Wollarias”? 2. Who is this dr. Braid? What’s this person’s function on Devotion, and what this “Y.” stands for? 3. :,( Am I the only one who remembers Thighfriend anymore? @Android 21 3/7: Nah, I remember. “Thighfriend” is a parasite, currently attached to Mike’s femur, I believe, and its sentience isn’t (yet) known, so… hardly a character. We’ve also met the first LEVi and unnamed Martian automatons, who tried to establish contact with Bex, but they aren’t especially unique or recurring. This page is breath-takingly beautiful. Then it’s heartbreaking. Yea, that`s what you`ve got, when you`re jerk, woman! I read the whole comic yesterday and i gotta say im IN LOVE with it! The story, the art, wow, i cant wait for the next page. Are those two bumps on her face going to develop into weird fungus filters to help her better adapt to the environment? Tentacles for climbing would be nice. Well, could hurt. The Spots are directly in her Face, after all. Plus, speaking with them -could- become a struggle. You’ve already abandoned one child, what’s another, right? Stop crying and get climbing lady! We’ve got a comic to read! *flail* Oh halp I just found this today and read it all and now there’s no more and I need to go to Patreon and where is Mike and yay Kalla is back and Bex you kept Levi on a leash, what did you expect? *flop* More please? I’d like to know more about these ‘vent tenders’ we can see in the distance.